The all-new Suzuki Swift is set to reach India in a few months – by February 2018, to be exact. Slated for launch at Auto Expo 2018, the new generation Swift is a follow up to the very popular hatchback by Maruti Suzuki, and is slated to come with a number of upgrades, the most notable of which is the all new exterior design. Here’s looking at everything that you can expect from the all new Maruti Suzuki Swift, which has the promises of being a popular offering in India when it launches next year. The all new Suzuki Swift will come with the new Maruti SmartPlay infotainment system. This unit will not be radically different from the SmartPlay unit that we presently find in the likes of Ciaz, Ignis, S-Cross and others, but will come with updated firmware that also supports Android Auto, alongside Apple CarPlay. The infotainment system will also include standard features such as FM/AM receiver, Bluetooth audio streaming, media input via USB, SD card and aux, and an integrated navigation system. The typical dash-mounted infotainment display format is also expected to remain the same, and the Suzuki Swift will also get steering-mounted controls and a multi-information display on the central instrument cluster, as is the norm. Other features, which should make their way to the Swift, include all power windows with front automatic windows, an automatic climate control system, LED headlamps and tail lamps with new design, rear parking camera with sensors, and even an engine start/stop button. The new Swift will essentially retain most of the features that the new Maruti Suzuki Dzire comes with, and hence offer a more premium in-cabin experience. In terms of the drivetrain, the new Maruti Suzuki Swift may also get an SHVS (Smart Hybrid) variant, but that cannot be ascertained as yet. The most striking bit of the new Swift is its new design. 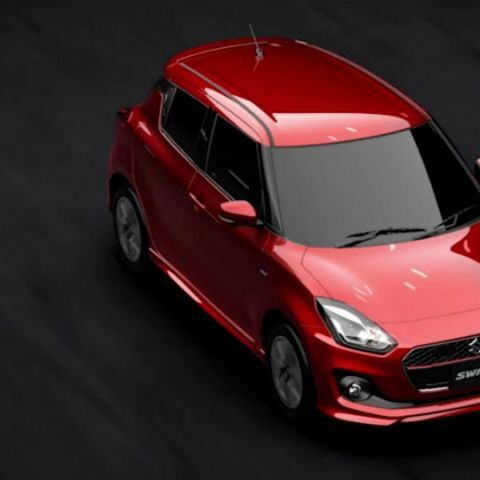 Suzuki has succeeded in retaining the hard arched design language of the older generation Swift, but created a new design that looks smarter and more modern. From the rear door-mounted door handles to smoother lines, the new Swift looks more refined than before, while still remaining identifiable. The India variant of the Swift is slated to come with a higher ground clearance which would somewhat disrupt the low flung stance of the new Swift, but it should still be a refreshing addition to Maruti’s car lineup in India. On the inside, the Swift gets sportier upholstery than before, with a new dash design, better leg room, and even more boot space. The taut roof line, coupled with the small rear window makes us skeptical about how the rear seat visibility, head room and shoulder room will be, but we’ll only get to see it once it launches early next year. The Maruti Suzuki Swift is expected to retain the 1.2-litre petrol and 1.3-litre diesel engines when it launches in India, with the diesel engine being reengineered to produce more power. This engine may be replaced in the near future with a 1.5-litre diesel engine, but for now, it remains. Alongside, Maruti may also bring a variant of the Swift with the 1-litre Boosterjet engine that powers the Baleno RS at the moment. The Swift is also set to get automatic CVT transmissions, in both petrol and diesel trims. The relevant auto variants will also get paddle shifters, behind the new, plush steering wheel. It is also built on Maruti’s new HEARTECT platform, which is lighter yet more rigid. This will add to better fuel economy and improved handling of the car, while making it safer and more stable. I am looking to buy GTX 970 4gb but my friend said me to wait till june as new GPUs are coming. what to do?